Le Fresnoy, or the National Studio of Contemporary Arts, is structured around a school directed by an artist, Alain Fleischer, who invites others to train still others. This year, the curator of the exhibition, Benjamin Weil, whose international experience is well known, took up the challenge of revealing a common meaning in more than fifty artistic proposals ranging from performance to film through installatio	ns and apparatus. It is said of ships that, "if they have not tasted wine, they'll taste blood!" But why christen ships with champagne when you can do the opposite? It is 7:30 pm and the public is getting antsy on this inauguration day for the fourteenth Panorama exhibition. Monsieur Moo, in collaboration with Louise Drubigny, has been preparing for months for what will last less than a second. He has called upon a local crane operating company to suspend "Yolande", which is the name of the boat, more than fifteen metres above ground. Together they have piled a few thousand bottles of sparkling wine against a cinder block wall. 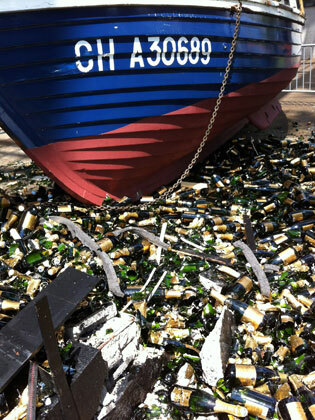 Around 7:45, the wooden hull is released to come crashing against the bottles that it explodes before causing the cinder block wall to collapse. The first shock is crystalline, while the second is duller. Monsieur Moo and Louise are happy and the public is overjoyed. As for the spectators who come to the site of the performance later, they can only observe the traces: "Yolande" washed up on a floor strewn with bottles of Blanc de Blanc that are mostly, but not all, broken. Like members of a scientific police unit, they attempt to imagine what has happened here, to reconstitute the scene without however grasping the motivation behind such an artistic inversion. In 1921 Alexandre Rodtchenko covered three canvasses with primary colours - one red, one yellow and one blue. The immersive voyage entitled "DSLE -3-" that the Dutch artist Edwin van der Heide offers us on the film studio could be considered a homage, by transition, to Rodtchenko's monochromes. In the beginning there is red light all around and in the end, there is blue light all around. The sound at the beginning of the voyage is as pure as the light, but gradually becomes more complex to the point of becoming granular, disturbing the image. The broad swath of coloured light that surrounds the spectators is then swept aside by the rhythms that evolve, accelerate and then slow down. We might all be passengers on a space ship, which makes us think of the endless transition in Stanley Kubrick's masterpiece, "2001: a Space Odyssey", another voyage only in colour. It would seem that the more abstract the work, the more one projects oneself by injecting the souvenirs they trigger in us. Entering now into the space of the exhibition, all the works dialogue with each other, as this is what the curator wanted. 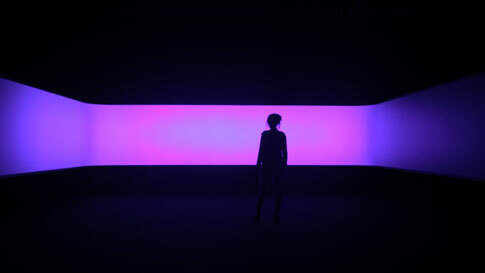 There is no black box, except at the entrance where the work "Mol" by Ryoichi Kurokawa is a bit apart from the others. Two projections that are practically the same suggest to us that there is perhaps a parallel world to ours where everything is similar, or almost. The images literally float in the space without our knowing exactly where they come from. Two parallelepipeds, just for an instant, evolve in the emptiness before fragmenting into innumerable particles cut like diamonds. As in weightlessness, they are subject to the sonic accidents of a music of noises. The three-dimensional monoliths that we have seen are still in our minds before our eyes without our being able to identify them in the visual chaos that the sonic accidents struggle vainly to organise. 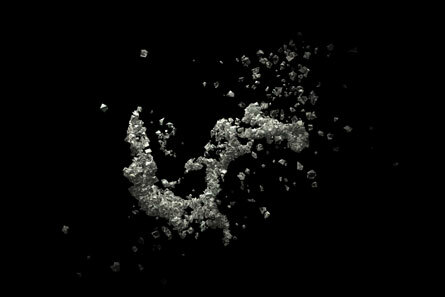 These particles that float in the spaces of the images without support remind us that emptiness dominates in the universe, from the infinitely small to the infinitely big. In the centre of the exhibition, there is a card that announces the installation "Hand-held" by David Rokeby. More than all the other written explanations, this one stands out because the work is invisible. In order to activate it, spectators must enter into its space that one can imagine, a posteriori, is cubic. 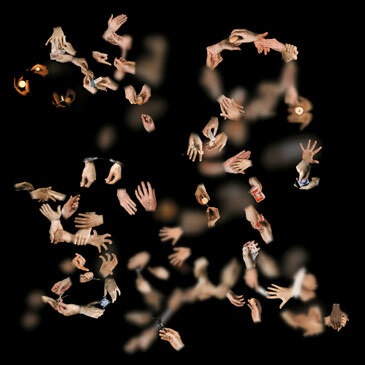 In this cube of nothing, our bodies trigger the projection of images of hands, playing cards and other objects. So naturally we reach out to receive these images. By moving up and down, you can make the image sharper. The artist obviously knows the frescoes in the San Marco convent in Florence where Fra Angelico painted disembodied hands. But this is also a reference to those who walk in the street staring at the telephone they are holding in their hands. Within the cubic space of his work, the Canadian artist has piled up images so that others will look for them and find them. Does he even know himself where he has hidden them, as one might hide a treasure the better to forget about it? The spectators comment on the images that appear in the palms of their hands amidst choreography improvised for the occasion. They inhabit the space of the work that the artist has cut out of nothingness. Art history is filled with mirrors, from Velasquez to Pistoletto and Arthur Zerktouni, with his installation entitled "In Memoriam", prolongs the list of gleaming artistic surfaces. 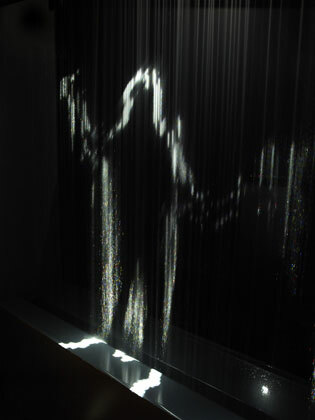 But here it is in the droplets of a screen of water that spectators are reflected. Close up, they are like red, green and blue pixels. From afar they form a mirror that reflects our image with a certain latency. Our silhouettes, defined in relation to something else, are definitely fluid and there's a lapse in time before they disappear. Arthur's mirror seems to act on time, to slow it down a little. For this reason we can play with the shadow of this other that we slightly precede. Spectators perceiving this latency make lateral movements as though to test this decidedly interactive installation. The water, which we imagine is in a closed circuit, ceaselessly refreshes the image of those who are observing it while also evoking the participative video artworks of pioneers like Peter Campus and Dan Graham. There are apparatus in the domain of prison architecture that allow one person to survey many. It is called panopticon and dates from the end of the 18th century, whereas the satellites of today, be they civil or military, authorise a few men to survey all the others. The audiovisual installation "Horizon of Events" by Maya Da-rin functions around GPS technology, which stands for Global Positioning System, which we know was invented by the military. Starting from a hilltop in Marseille, she is fitted out to communicate her position in real time to the camera she has left there. 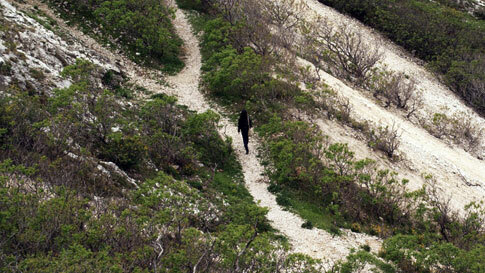 The camera, constantly informed by satellites, follows the artist as she walks away towards the shoreline below. The spectators try to follow her with their gaze, but are limited to guessing where she is, hidden as she is by the buildings of the city. We can imagine her in the centre of the frame, which moves intermittently. The passer-by is also equipped with an audio sensing device that allows the spectator to match up information to better guess the position of she who knows she's being tracked. But are we not all permanently under surveillance from a constellation of invisible, silent satellites? When we look in the sky, we might imagine he or she behind their screen possibly spying on us without even knowing who we are. Lastly there is "Cellulairement" by Dorothée Smith, an installation of an apparent complexity that functions around a simple concept: merging the heat of two distant bodies without contact. 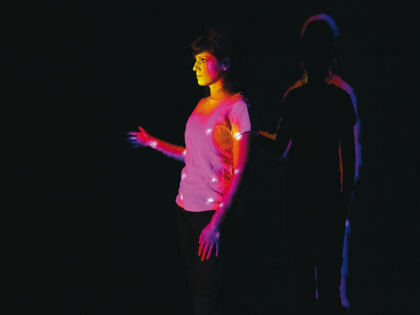 The space of the work is occupied by equipment that includes a thermal camera allowing spectators to discover representations of themselves through the quantities of heat they generate. But this data is archived and sent to the artist who perceives the heat of the other via, she tells us, an implanted electronic chip. The idea that we can correspond with another person through the body heat we emit without actually controlling it is interesting because communication from a distance quite often implies accepting filters by words as much as by silences. Whereas here, we can imagine sharing the heat we give off and that keeps us alive and merging with that of another person who has become its host. Written by Dominique Moulon for Digitalarti and translated by Geoffrey Finch, July 2012.